Are you consciously choosing the training mode for each of the training that you are doing? There are many choices of training modes available, so how do you decide what is best suited? Once you have identified a training need, what are the factors to keep in mind when deciding on the mode? 1. The topic – Is the real expertise residing in-house or not? If it is a topic relevant for an entire industry, you are very likely to find the experts outside. It may be a classroom trainer or an online program. Do keep in mind if you need tailoring of content. If it is a very topic that is specific to your organization, you are better of asking an internal expert to train, rather than asking an external trainer to tailor his related course. 2. The audience – How would the learners want to learn? Are they comfortable learning in classroom or do they prefer learning on a device? There is a misconception that the lesser educated employees can\will not self-learn on a device. Many a times they are hesitant of classroom interactions and can self-learn more freely. 3. Logistics – Are the learners fine with getting pulled out from their regular work for some hours\days for a training? What does it mean for the work tasks they must complete? What is the cost of pulling them out in addition to the cost of physical logistics? Is it better to give the choice of deciding the training time to the learner? 4. Recurrence: How often do you need to repeat the training? Would it make sense to develop many internal trainers who can deliver? Or would it make sense to get the training online? 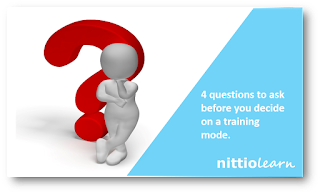 Consciously asking yourself the above questions will help you arrive at the correct training mode. The importance of L&D in today’s corporate environment is greater than it has ever been. 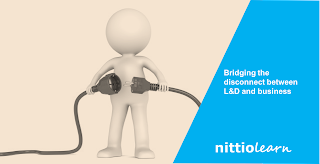 Yet, the title of this piece rests on the premise that there is a disconnect between the L&D teams and the business. First, let me justify the title. You might think that the title does not apply to you or your company. Possible? Of course. I have met hundreds of learning and development leaders and managers as part of my work and apart from a few exceptions, this disconnect is glaring – as daylight. So, you might be that exception J. This personal perception is backed by Linkedin’s Workplace Learning Report 2017which points out that only 8% of CEOs see business impact and only 4% see ROI of L&D. 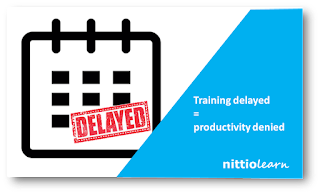 One key metric for the training or learning and development department is the wait time for delivering a training once a training need has been identified. When a training need is identified by the business, the belief is that the training will either plug a weakness or accelerate performance. In either case, business is looking at increased productivity (read “dollars”) post the training. This is even more applicable for functional training since functional training can have a very immediate impact. Even with this awareness, waiting time remains the bug-bear of L&D and training teams. So, here are some ways in which technology can help you reduce wait time to zero. Gamification, gamification everywhere, but none for me. It is proclaimed as the holy grail of online self-learning. 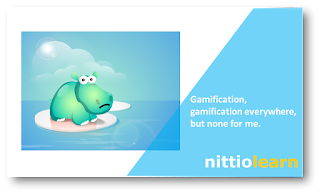 It is a no-brainer that gamification, with its inherent characteristics of engagement, and challenging the learner against self or colleagues, can lead to better learning. So why is it that most self-learning modules still do not carry the gamification elements?